I use a 12V 20W halogen lamp (MR16) and a 4.2Ah SLA battery for my bike light system. The battery has only limited life at this power rating, so I designed this cheap light dimmer to reduce the battery drain and allow for longer rides at night. 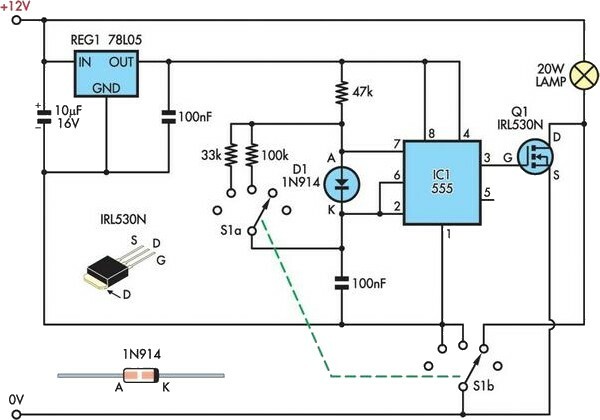 Based on a simple 555 timer circuit and Mosfet switch Q1, it works by pulse-width modulating the 12V supply to the lamp. The 555 (IC1) is wired as a free-running oscillator, with two different mark/space ratios selectable via a 2-pole, 5-position rotary switch (S1). The third switch position bypasses the electronic circuitry and connects the lamp directly to battery negative. This gives three power levels of about 7W, 13W and 20W. A logic-level IRL530N Mosfet with a drain-source "on" resistance of only 0.1Ω ensures low losses and eliminates the need for a heatsink. An STP30NE06L Mosfet (Jaycar Cat. ZT-2271) would also be suitable.